Meatless links, it goes without saying. Lent is the reminder that all this sort of thinking is, well, ashes. Bupkis. Skubala. “Refuse”—as English translators of Scripture politely put it. It’s the reminder that this passing world is passing indeed and that none of that stuff is going to matter in the final analysis. Lent is for focusing the mind, heart, and spirit on God: for getting away from it all, not on an all-expense-paid Lenten Caribbean Cruise, but to the desert. On paper, Eastern fasting discipline—about which I have published several articles over the last dozen years—seems very strict indeed (though in practice not everyone follows it); and on paper Western fasting discipline seems rather minimal—though in practice nothing prevents Western Christians from undertaking a more rigorous fast. But both disciplines currently have some rather strange logic behind them, which I wish to challenge here by means of a “scholastic” method. I shall consider the question in two articles. • Homiletic & Pastoral Review has posted two Lenten pieces: an essay, “Lent: A Time for Conversion”, by Fr. Richard Gribble, CSC, and a reflection by HPR’s editor, Fr. David Vincent Meconi, SJ, titled, “Our Lenten Imitation of Christ”. Lent, like Advent, is a time of penitence. Here we identify ourselves with the Lord’s fast and ordeal in the wilderness, which He bore for us. This raises a point worth noting in passing. There are some varieties of Protestant theology and spirituality that so stress “the finished work of Christ” and the fact that He accomplished everything, that they leave no room at all for any participation on our part. Such participation, encouraged by the ancient Church, does not mean that we mortals claim any of the merit that attaches to Christ’s work, much less that we can by one thousandth particle add to His work. Nevertheless, the gospel teaches us that Christians are more than mere followers of Christ. We are His Body and are drawn, somehow, into His own sufferings. We are even “crucified” with Him. Read the entire piece on Insight Scoop. The full essay can be read on Ignatius Insight. The entire piece, with graphics, can be downloaded as a PDF. I also put together a guide to reflecting upon and praying more deeply the “Our Father”. 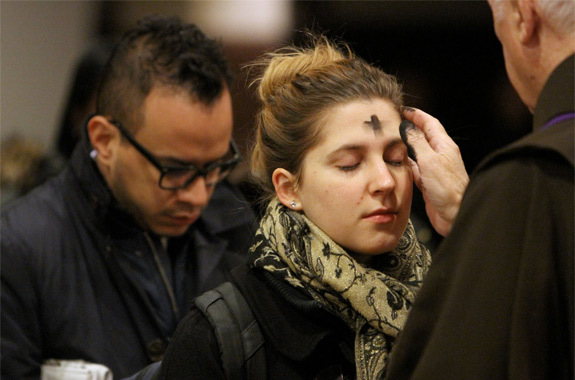 Lent is an opportunity for us to repent and re-order our lives to God. The first words of Scripture we hear today reflect this reality: Even now, says the LORD, return to me with your whole heart, with fasting, and weeping, and mourning. Why such things? They remind us that we do not live on “bread alone” (Matt 4:4), and that it is God who fills us with joy and peace (Romans 15:13). By fasting, by accepting our deep need for God we return to the natural order of things and find peace for, as St. Augustine has said, “Peace is the tranquility of order.” When all is right in the world, when we let God be God, we find peace and plenty for if God is our first desire, we are filled. It is interesting, then, that so many Catholics who have in many respects turned away from their faith choose this day to return. There is something about the ritual of the ashes and the mark upon the forehead that draws them back. Some say they see it as an opportunity to publically announce their identity as Catholics; some just find the ritual of it to be otherwise rewarding. But what is really happening here. • The Aggie Catholics site has a huge list of Lenten resources and links. • A great musical resource is the newly released CD, “Lent at Ephesus”, which was reviewed recently for CWR by Dr. Christopher Morrissey, professor of philosophy and Latin, and accomplished musician. Can We Talk About Fasting?